The Battle of the Borders might be a clearer name, the battles on France's borders with Germany and Belgium, the initial execution of the French and German war plans, with France's attempt to drive into Germany across their shared border, and Germany’s invasion of neutral Belgium and Luxemburg to strike France along its northern border and seize Paris. In Alsace, French forces crossed the Vosges Mountains, and took the Alsatian city of Mulhouse near the Swiss border on August 7. The Germans retook it two days later, a loss that led General Joseph Joffre to create the Armies of Alsace and Lorraine recalling Generals Pau and General Maunoury from retirement to lead them, two of the numerous reconfigurations of his forces he would make in the coming days. As Joffre executed his Plan XVII, Germany was conquering Belgium, advancing much further west than Joffre had anticipated. 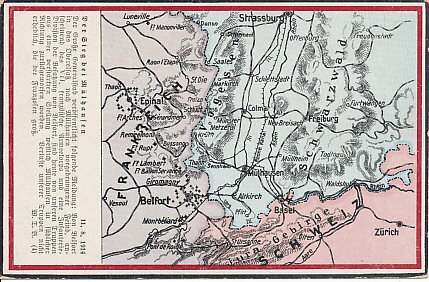 With the Army of Alsace and the garrison at the fortress city of Belfort holding the southeastern end of the French line, the First Army (under General Dubail) shifted north. On August 14 the First and Second Armies (Castelnau) advanced into Lorraine. 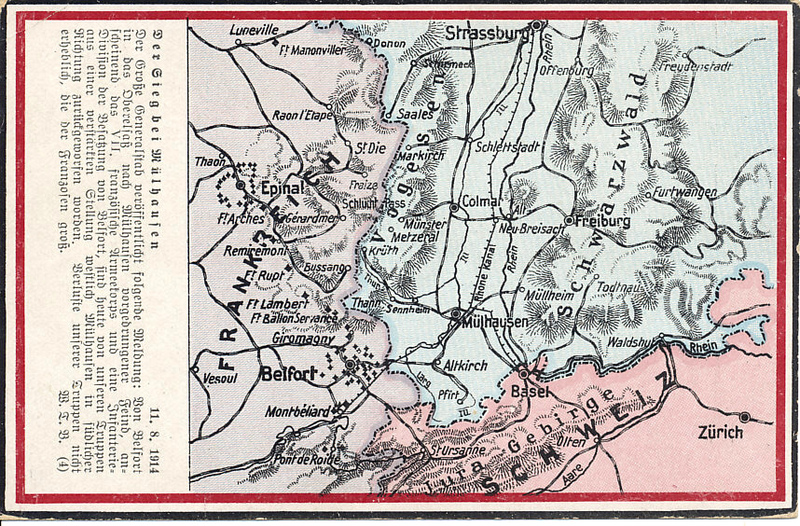 Initially successful, the French advanced to take Sarrebourg, Dieuze, and Chateau Salins, before a counter-attack by the German Sixth (under Crown Prince Rupprecht of Bavaria) and Seventh (General Heeringen) Armies threw them back, driving the French across the Meurthe River and to the heights around Nancy. German war plans had called for falling back before the French advance, luring them from their supply lines, and into a trap as the attack through Belgium advanced. By driving them from Germany and back into France, Rupprecht and Heeringen allowed the French forces to fall back and regroup. On August 19, French forces again took Mulhouse. Despite the movement of German forces across Belgium, Joffre held to his plans. North of Alsace, Joffre ordered the Third, Fourth, and Fifth Armies to advance to the northeast, crossing the Ardennes Forest into Belgium, a goal he thought they would achieve before encountering German forces. He was mistaken. From August 20 to 22, his armies advanced, but the German Fourth (General Albrecht) and Fifth (under Crown Prince Wilhelm) Armies were advancing to the southwest, and stopped the French offensive. On August 21, 100,000 French cavalry attacked the German center in the forested hills as the Germans were strengthening their forces. 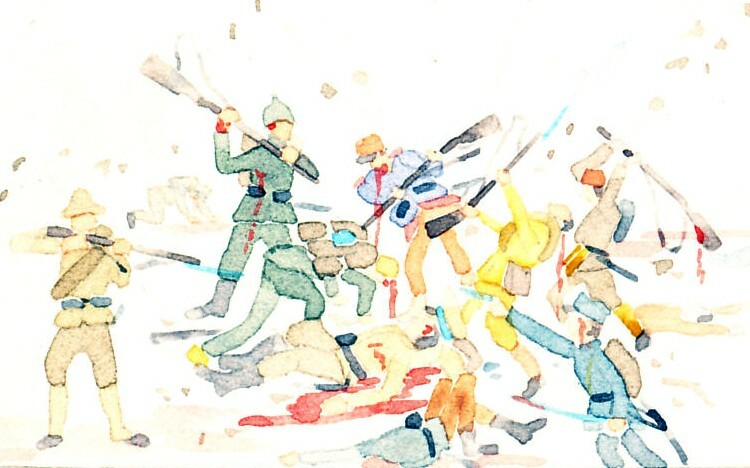 The attack failed and the French retreated. Joffre had expected two German drives, the first advancing west directly into his forces in Alsace-Lorraine, and the second into Belgium before turning south or southwest into France relatively quickly and relatively easterly. He resisted the notion – advocated by General Lanrezac commanding the Fifth, and westernmost, French Army – that the German drive into Belgium was a conquest that would continue westward across the Meuse River before wheeling into northern France. By following Joffre's order of August 15 and advancing into Belgium between the Sambre and Meuse Rivers and towards the Belgian fortresss of Namur and Dinant, Lanrezac had created a salient with the German Second Army before him, the First on his left, and the Third on his right. He was on the left wing of the French Army, the end of a line that stretched southeast to Switzerland. His left wing was exposed, and he was in danger of being outflanked. With the French defeats in Alsace-Lorraine and the Ardennes, and with the Germans moving west across Belgium at as much as 30 miles per day, Joffre finally sent forces to the French left to counter the Germans moving through Belgium. By August 20, the British Expeditionary Force (BEF) under Sir John French had reached Le Cateau, the staging area agreed between the two armies before the war, now west of Lanrezac's Fifth Army. The BEF began advancing to the northeast. As Joffre adjusted and repositioned his forces, Chief of the German General Staff Helmuth von Moltke weakened his armies sweeping through Belgium and France. Loath to give ground in Alsace-Lorraine or East Prussia (where Russia had crossed the border and defeated a German force in the Battle of Gumbinnen) he transfered forces from his right wing in Belgium and France. He also moved one army corps from von Kluck's First Army to cover the fortress city of Antwerp to which the Belgian Army had fallen back and from which it sortied to harass the German invaders. Commanding the French Fifth Army, General Lanrezac, who had correctly predicted the extent of the German movement to the west, insisted on moving further west as well. The British extended their line so the Germans did not outflank them and cut off their lines of communications and access to the Channel ports. Both the British and Lanrezac moved north. In advancing, Lanrezac opened a gap with the French Fourth Army on his right, and was shortly engaged with the German Second Army moving towards his line, and the German Third Army on his right. On the German right, the First, Second, and Third Armies advanced against the French and British, although neither side had a clear idea of the position of the other. Rather than continuing to the southwest in the move intended to envelop Paris and the French Army, Von Kluck, in command of the First Army on the German right wing, turned directly south. The Second and Third Armies advanced towards Lanrezac. The three German armies - a total of 34 divisions - advanced on the 14 divisions of the French left – the French Fifth Army with 10 divisions and the British force with 4, all of them advancing. On August 22 the forces met. South of the Sambre River, the French Fifth army faced the German Second Army, and had the German Third Army on its right flank, and were driven back in the Battle of the Sambre. Hausen's Third Army was still on the French right flank, and in position to separate it from the French Fourth Army. The same day, August 22, the advancing British ran headlong into the German First Army in Mons, Belgium. The Battle of Mons - a British fighting retreat from Mons - was a small engagement, but the first British battle. The British were ill-equipped, with no howitzers, hand grenades, or wireless equipment. By the evening of August 23, both the French Fifth Army and the British Expeditionary Force were in retreat, being driven from Belgium. By the morning of August 24 the German armies were driving the and British and three French armies back across the entire front as the Allies conducted a general retreat.